L is also for “Long story, but worth it“. The link to this was posted on the online conference for my university. It’s the best description I’ve ever read of what it’s like to have a chronic illness, and how you can explain it to “normal” people. Imaganitive and original post title, I think you’ll agree! Image-heavy post ahead, but I think it’s worth it. 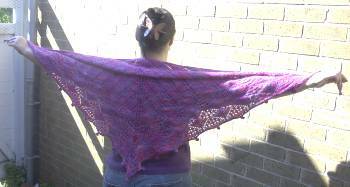 Yarn: Lorna’s Laces Shepherd Sport in Iris Garden. I used 2 skeins plus 5/7th of one (yes, I am a scientist and I did weigh it!). More details on it’s webpage here. Edit: I completely frelled up. Someone else had said that they would send me some Kool-aid and I assumed that this was it. NEVER assume anything. 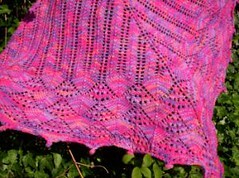 So, thank a thousand fold zknitter, from the knittyboard, and I am soooooooo sorry for the mix up. I’m still undecided on whether I like her enough to keep her – useful, aren’t I? Constructive criticism will be welcomed (as long as it’s not of the “God, you’re so fat, that’s why it doesn’t suit you” variety – as a certain relative of mine might say). I wore her today and I’m warming to keeping her. I’ve fixed the problem with the display in Internet Explorer and re-jigged a few things like the Google search box in the sidebar (you can use it to search the blog or the internet). If you want to search for a project I did sometime in the past, use the search box on the blog, or the one on my home page. I’m working on installing a search box on all the pages on my web site, to make things a bit easier to find. All of this is not too bad for someone who learnt her HTML in the dark days of the internet before there were images (yes, all those stories you were told are true!). Oh, and how’s this font? Better or worse? I’ve done one repeat on the first sock and, despite a few fluff-ups due to not concentrating hard enough, it’s going well. 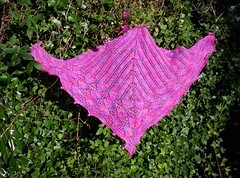 I got a comment from Margene about my Mariposa. As in the Margene. As in Utah, Zeneedle, Margene. It’s not right that I should be this excited, is it? I’ve really got into the rhythm of these socks now, and they are going fast because I’m only working the patterning on the top side of the sock. The reason for this is twofold; firstly, I think it would be a bit uncomfortable to walk on a slip stitch pattern and secondly, the diameter of my pal’s feet is fractionally larger than their ankle diameter, so that should help it fit better. No, nothing with diamonds! It’s for all us “Knitting Amys”, since there are quite a few of us around. I’ve set up a blog and to join click here. Ahh, yes. 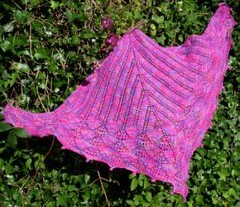 I was sitting shivering the other day wrapped in my super-cheap viscose “pashmina” and I suddenly remembered my merino wool shawl was lying there all unloved. I’m increasing four stitches every other row so, obviously, each row gets longer and longer. 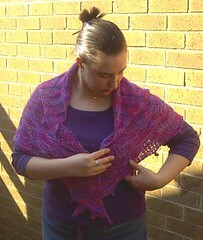 I’ve just got one more repeat of the “blossom” part of the shawl and then I’ve got the bobble bind-off to do. Wish me luck! It’s Cotton Rayon Sport from Mystical Creation Yarns in the States. 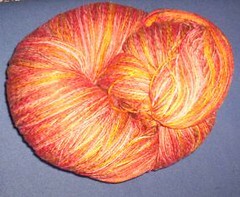 I got it via the Yarn Co-op on Yahoo Groups. 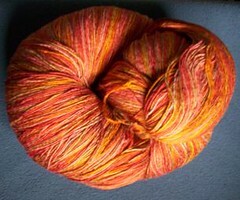 The colourway is called “Copper Desert”. I’m thinking of a 3-to-2 Any Gauge Sweater, working the diagonal bit to my shoulder-to-shoulder measurements and adding side panels so it fits more like a set-in sleeve than a drop shoulder top. I already have the pattern, so a quick tension square will tell me what the yarn wants to be! The apology: the post I made after I came back off holiday did not turn out like I had envisioned it. Whilst sitting in a caravan looking at the Irish Sea I composed several eloquent posts, in my head. I sat down on Friday evening and, instead of a piece of writing Churchillian in style about how we will never surrender to the threat of terrorism, what came out was a lot of anger and a bit of swearing. I know that I’ve lost at least one reader (via Bloglines) and so this apology will, obviously, never reach them. I wanted to say “Sorry” for the way in which I expressed myself, and I give myself a D- for it. I’ll keep the post up, because although it was clumsily expressed, it does indicate my feelings on the matter. Now, back to the knitting (this is a knitting blog, after all). Click on any the photos to view them in all their large, blurry, 3.2 megapixel glory! I’ve done a garter stitch cuff on this because I plan on doing a garter short row heel and toe (for reasons that will be revealed after the 15th of September!). The cuff rolls when it is not on the leg, but does an admirable job on the leg. (S)he said that they tend to wear “calf-length” socks, more than “ankle-length” socks, but I’ve no ideal how those two vague measurements look. I’ll have to guess, I suppose! I’ve now finished the first repeat of the “blossom” part of the Lotus Blossom. You may be able to see a red lifeline that I had to put in after I’d started knitting from chart 6 instead of chart 5. DOH! Not enough progress to warrant a photo, to be honest! I’ve started on the back portion of it now. This is the right back of the top. I managed to do two fewer rows in the garter stitch welt than on the front, and this is the back piece that is “public”. I’ll either leave it or pick up and knit two more rows when I’ve finished it. After hearing that the straps were working out a little too big for most peoples taste, I’ll probably alter those as well. I fully anticipate having finished the right back of Mariposa the next time I post, but that’s probably the only photo-worthy thing I’ll have done. I could also photograph the progress on my oceanography assignment, but it’s not really all that exciting. Or indeed knit-related!